What Sporting Event Not Involving Your Team Made You The Happiest? I’m still high off basketball. Last night I felt like I was on drugs, alternately near tears and euphoric. I think I slept with a huge grin on my face. This is weird, because I do not care about the Cavaliers in the least. 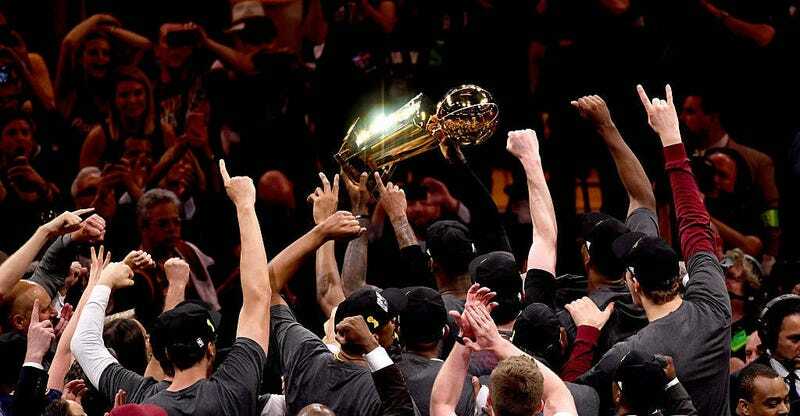 There was a lot going on here, from Cleveland’s ingrained underdog role, to the Warriors’ postseason heel turn, to the redemption stories among the Cavs (not all of them required, by any means), to the overwhelming odds overcome and the game-long tension being released in a moment that was clearly as emotional for the players as you could ever hope for. For all the factors involved, I’m nearly as thrilled for Cleveland and its fans as I would be for a championship by my own team. So: What’s the happiest you’ve ever been over a game in which you didn’t have a horse in the race? I asked this on Twitter last night, and two answers kept coming up: the Red Sox coming back to beat the Yankees in the 2004 ALCS, and the Giants shocking the Patriots in the 2008 Super Bowl. Both very good answers, but they can’t be mine because my teams were involved in each. They provide an obvious blueprint for a universally celebrating sporting outcome, though: an overwhelming favorite vanquished unexpectedly and a fanbase portrayed as smug ending up on the wrong end of history. Recency bias is real and strong but I cannot think of anything I enjoyed more than the Cavs beating the Warriors. What’s yours? Tell me why in the comments.